A Goomba in Mario Party Star Rush. 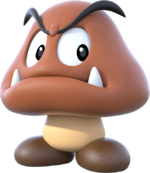 Goombas (クリボー, Kuribo) are recurring enemies from the Mario franchise, and are the most common unit in Bowser's Koopa Troop. A Goomba's walking animation in Super Mario Bros.
Goombas first appeared in the original Super Mario Bros., programmed as the most common and most basic enemy in the series. They simply walk around, turning around at walls and falling from ledges, and hurt Mario on contact, but they can be quickly dispatched by jumping on them. In some later games like Super Mario 64 they actively pursuit a nearby player, but still remain very weak. Bigger versions also exist. Goombas are common enemies that appear in the Mushroom Kingdom stage of Adventure Mode. They can also have a chance of coming out of Crates, Barrels, Capsules, and Party Balls in VS Mode. Goombas walk back and forth on the arena, and thus often walk off the edge of a stage. Nearly every attack can KO a Goomba in one hit, and jumping on them or throwing them will KO them instantly; if the player makes contact with one in any other way, they will take damage with moderately low knockback. For every Goomba the player KOs, they get 150 points as the Goomba KO bonus. In VS Mode, Goombas inflict 8% damage on a player who makes contact with them. In Adventure Mode, the amount of damage it inflicts depends on the difficulty setting. Goombas also appear in the background of the Mushroom Kingdom stage, using their original sprite from Super Mario Bros. on the NES. A close-up of the Goomba stage in Event 14. Goomba is a special stage that can only be played in Event 14: Trophy Tussle 1. The battle takes place on top of an enlarged Goomba trophy, which can be won upon completing the event. The edges of the head can be grabbed if a character tries to recover. The Goomba trophy is unlocked by completing Event 14: Trophy Tussle 1 for the first time. Goombas are actually traitors who've defected from the Mushroom Kingdom's forces. They're a slow and predictable nuisance, as they always try to wander into Mario's path. Fortunately for Mario, they don't have much stamina, as a single jump on the head is generally enough to defeat them. Two Goombas near a Koopa. Goombas make an appearance in The Subspace Emissary as enemies. They simply walk around, and upon noticing a player they start charging them: unlike their Melee counterparts they can hurt players only during their ramming attack. Characters also now Footstool Jump when landing on one instead of bouncing up with no change in animation, which makes it harder to jump on several in a row because repeated footstools decrease in height. Goombas are among the least threatening enemies in The Subspace Emissary. They have among the lowest HP, where most attacks will KO them in one hit even on Intense difficulty, and a jump on their head will always instantly defeat them. Their movement speed is slow (though they are slightly faster when they charge), with no ability to jump, and they appear oblivious to the player until approached. Their sole attack is slow in start-up lag and easy to guard against. Along with being slow, the Goomba's charge attack is weak, dealing low damage and knockback, having low KO potential overall even on Intense. When a Goomba begins its charge attack however, it will continue for quite a while, and if it goes past the player, it will turn around to then charge again. Although Goombas are never specifically stated to be members of the Subspace Army, they serve as subordinates of Bowser, who is known to be a high-ranking member. It is currently unconfirmed whether Goombas have higher HP on later stages. A citizen of the Mushroom Kingdom who sided with Bowser when he invaded. Goombas slowly chase after Mario on stubby legs. They're not the toughest creatures and can generally be defeated by jumping on them, which makes them disappear. They have fierce fangs, but they don't seem to serve any purpose. Though a nuisance to Mario, they're decent at baseball and mah-jongg. 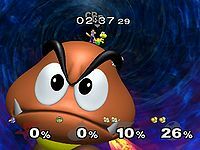 Goombas appear as enemies, exactly retaining their Brawl behavior and weakness. 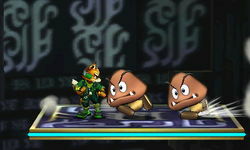 Goombas also appear as part of the Mario-themed Vs. Enemy Team final battle. The Goomba trophy appears in both versions. In Super Smash Bros. for Wii U it is part of the Bowser's Minions Trophy Box. Once loyal to the Mushroom Kingdom, the Goombas switched sides when Bowser invaded. Not that it mattered—they weren't really mighty warriors. In Smash Bros., they are equally weak, simply running at you. They must expect to get stomped by now... Don't expect a lot of fanfare for beating one. Once loyal to the Mushroom Kingdom, the Goombas switched sides when Bowser invaded. Not that it mattered - they were never exactly mighty warriors or anything. They're weak in this game too - the worst they'll do is run at you. At this point, they must just be expecting to get stomped on... Don't expect a fanfare if you beat one. The Goombas' grumpy little faces aren't scaring anyone. In fact, if Mario found himself in front of a sea of Goombas, he'd just get right to stomping! They were once loyal to the Mushroom Kingdom, but they turned traitor when Bowser invaded. One jump's usually enough to take them out. Foes don't come much weaker than this! 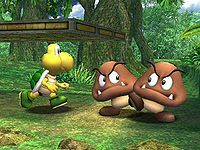 Goombas in the Super Smash Bros. series walk in a sidestep fashion, similar to their NES appearances rather than the standard 3/4 gait they have in the New Super Mario Bros. games. They switch to the standard gait when charging at characters. This page was last edited on February 12, 2019, at 12:29.